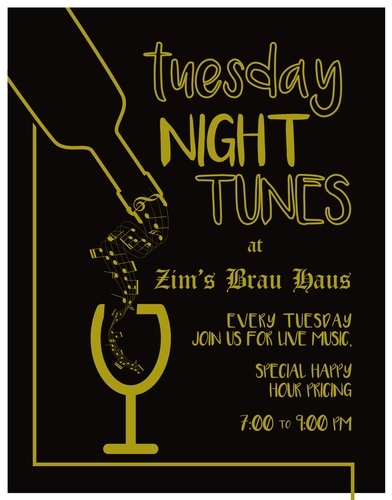 Tuesday Night Tunes at Zim's Brau Haus, is a weekly gathering where friends come to meet friends. Come enjoy live music by electric duo Al Hare and Kenny Olsen.They mix country,blues and jazz to create a fun friendly vibe for the guests to visit while experiencing Zims wonderful offerings of dinner and refreshments. Zim's Brau Haus offers all of their delicious appetizers at half price and has weekly dinner specials!! !